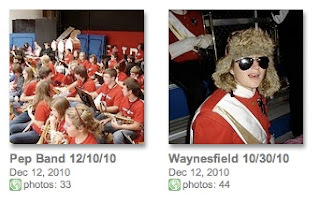 Photo Update: FMB @ Waynesfield and First Pep Band! 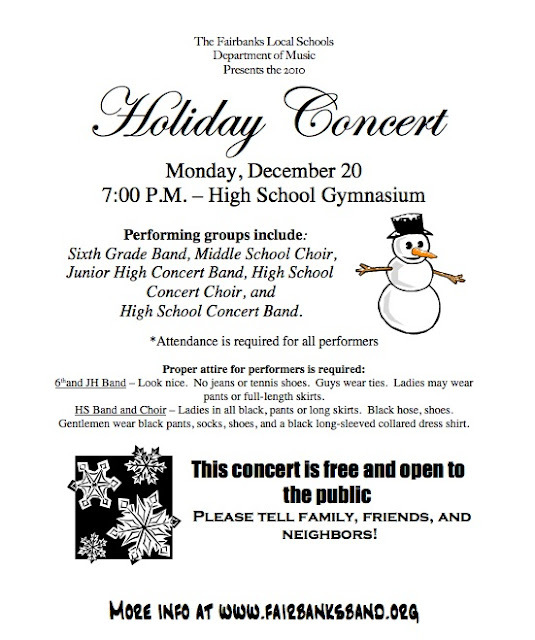 Fairbanks Music Department’s Annual Holiday Concert 2010 Monday, December 20, 2010, 7:00 P.M. Order of performance: 6th Grade Band MS Choir High School Choir Junior High Concert Band High School Concert Band MS Choir Middle School Choir will warm in the designated area at 6:30. As the busy season is under way I wanted to let you know that this Wednesday night meeting will be postponed until Friday night at 6:00. We have a home game and will need to be at the school anyway for pep band so we will have a short meeting before the game, while the band is rehearsing. Cuts down on the many trips we make to the school everyday! I will be in the cafeteria painting the panther cement paws....hope this season goes well for this fundraiser. Hope to see you all there for the meeting. If you have any questions or concerns please feel free to give me a call. Ms. Janchar and I both need help setting up and tearing down for both of the holiday concerts this year. The FES holiday concert is on December 13 and the MS/HS concert is on December 20. Band/choir students who help set up and tear down are eligible for bonus points in Mr. Keller's classes if they help. Set up time for both concerts is 5:30PM in the FHS gym. Tear-down takes place immediately after the concerts. Please sign up on Mr. Keller's office window to be eligible for points and to RSVP that you are helping. Thanks for providing this important service!